I have been extremely fortunate in life! I belonged to an upper middle class family in Pakistan where my parents supported me 100% till I came to United States in 2002. Now living in United States for more than 10 years I realize that there are so many things that we take for granted and water is one of them. Water is considered life and unfortunately there are many places in the world where water is scarce. I strongly believe that everyone can make a difference in the world and together we can help the less fortunate. With that in mind I have decided to donate every single cent I make from HighOnCoding or AzamSharp YouTube Channel towards Charity Water organization. Charity Water organization is responsible for providing clean drinkable water to the people. But I cannot do this alone and need your support. It takes around $5000 to sponsor a water project which can serve 250 people. Every donation counts to meet the goal of $5000. So, if you have been watching screencasts on AzamSharp YouTube Channel or reading articles on HighOnCoding or you just like me and want to return the favor then now is the time. 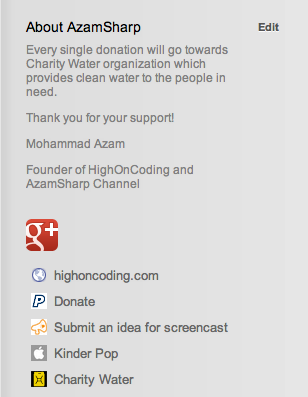 For convenience I have also added the donation link on AzamSharp YouTube Channel. Donations will be collected Charity Water website. Use the link below to donate to the campaign. Let's get the water flowing!